Winter Park Florida. A Peaceful Oasis In Busy Metro Orlando. Winter Park, Florida is an upscale town of about 30,000 people in the heart of Orlando's urban area. It's sometimes hard to believe such a quiet place exists so near to the bustle of Walt Disney World and Universal Studios. The town is often overlooked as a central Florida tourism attraction, but is definitely worth a visit or an extended stay. It's Park Avenue shopping district is a wonderful place to spend a day or a week. I lived in Winter Park on two separate occasions. It is a relaxing place to live. If you live close to downtown, everything you need is within walking distance. Shops and restaurants line the brick paved Park Avenue. As the name implies, there is a large grassy tree shaded park along the west side of the avenue. Flowers and ferns are cultivated and hanging from balconies all along the avenue. Many of the restaurants have sidewalk dining, and the whole Park Avenue stretch is a people watcher's paradise. Even the Amtrak station is right downtown across the park on Park Avenue. My son used to take the train down from Georgia and walk to my house to visit me. Several museums are within walking distance of Park Avenue. David Mizelle bought 8 acres of land in 1858 between the present Lakes Mizelle, Berry and Virginia. He founded the little town of Lake View on his land. In 1879 the name was changed to Osceola. In 1881 Loring A. Chase of Chicago visited the place, loved the area and bought 600 acres along Lake Maitland and Lake Osceola. He and a partner, O.E. Chapman, platted the town and named it Winter Park. 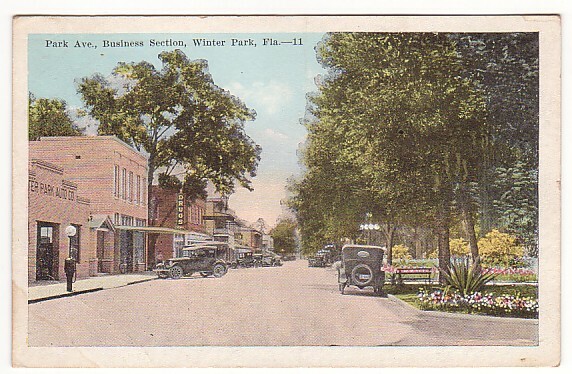 Winter Park began to develop in the 1880s as a citrus-growing center. It became a wintering retreat for wealthy Northerners, including Colonel Franklin Fairbanks and his partner, Charles Hosmer Morse. They visited the area on one of their Florida vacations and fell in love with the place. They were partners in various business including what is now the Fairbanks Morse Company, manufacturers of engines and pumps. Fairbanks Avenue and Morse Boulevard in Winter Park are named for these gentlemen who contributed much to the development of Winter Park in the early days. In 1885, the Congregational Church established Florida’s first institute of higher learning, Rollins College. The college's campus sits on the shore of Lake Virginia. Rollins is considered by most folks to be one of the best Florida colleges. Anthony Perkins was a student at Rollins before hitting it big as Norman Bates in Hitchcock's 1960 classic, "Psycho". Another Rollins graduate, Donald Cram, won a 1987 Nobel Prize for chemistry. Author Rex Beach, who wrote "The Spoilers" and other classics, went to Rollins and his grave is on campus. 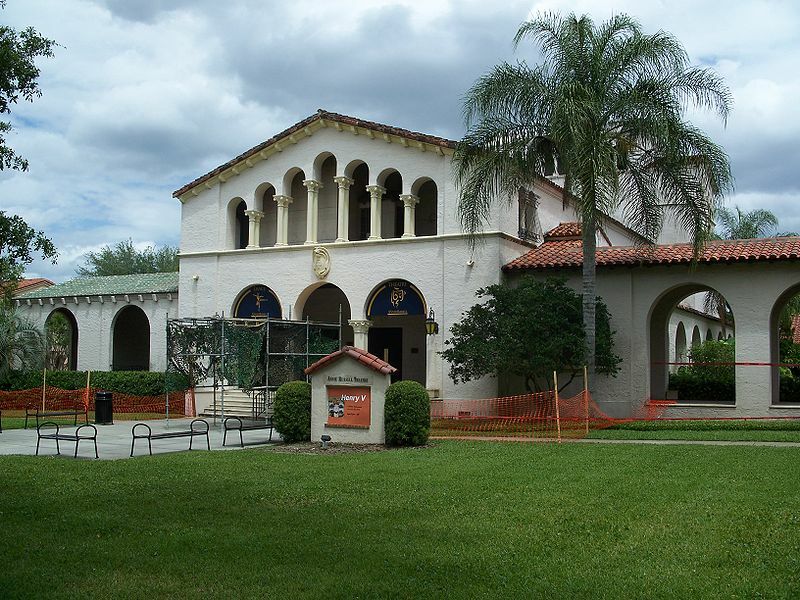 The architecture of Rollins College inspires visions of Florida's Spanish heritage. The campus is a pleasant place to take a walk. 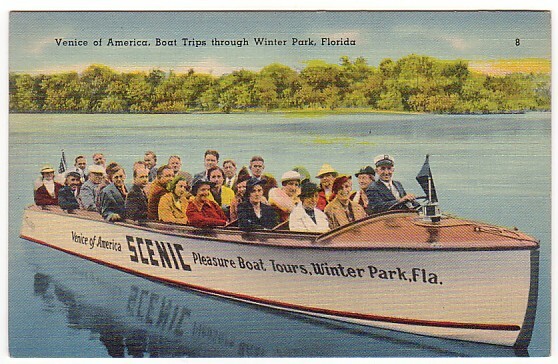 The scenic boat tour at the eastern end of Morse Boulevard takes passengers on tours through the narrow canals between Lakes Virginia and Osceola. They have been at this location since 1938. The tour highlights nature and local birds, but another outstanding feature of the tours are the opulent mansions, old and new, that line the lakes. Rollins College. A fine place to take a walk or get a good college degree. Wonderful old buildings with some great Moorish/Spanish architecture. The Charles Hosmer Morse Museum of American Art. The museum displays the world’s most comprehensive collection of works by Louis Comfort Tiffany (1848-1933). The collection includes stained-glass windows, lamps, jewelry and paintings. 445 North Park Avenue, Winter Park. Tel: 407-645-5311. Albin Polasek Museum & Sculpture Gardens. This museum is in the impressive former house of the sculptor. The house was originally owned by Harry Sinclair of the oil company. It is on Lake Osceola. The magnificent building and grounds showcase dozens of classical sculptures by the late Czech-American sculptor. 633 Osceola Avenue, Winter Park. Tel: 407-647-6294. Winter Park Sidewalk Art Festival. This annual sidewalk art festival is one of the best in the country. It takes place along Park Avenue every year. The festival is held on the third weekend in March. More than 350,000 people usually flock to this show to view the work of over 1200 artists. 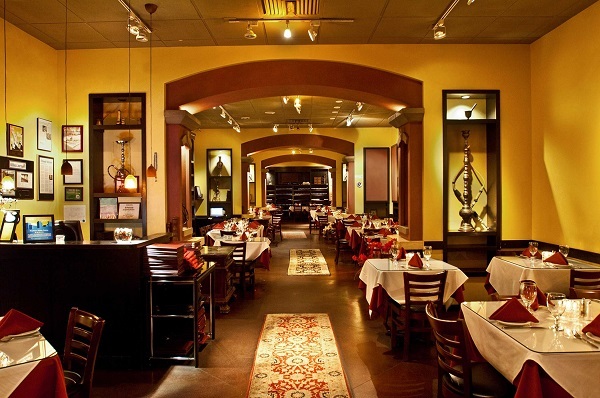 Bosphorous Restaurant is in the heart of the Park Avenue shopping and dining district. It serves a variety of Turkish food. The interior decor is muted and relaxing with walls painted a warm gold and plenty of archways and art objects to give it a Mediterranean feeling. Turkish food shares many of the features of other Mediterranean cuisines including Greek and Lebanese, but with its own distinctive style and flavor. For example, I had dinner here the other night and my entree was chicken sis kabob. It was marinated grilled chicken served on jasmine rice and a medley of pickled vegetables including red cabbage and onions. It was delicious and the portion was very large. Bosphorous has excellent bread, including lavas, that can be ordered with hummus and baba ghanoush. The bread comes to the table very warm and puffed up full of air and smells and tastes excellent. In addition to chicken dishes, they also have lamb entrees and stuffed grape leaves for appetizers. Other appetizers include the Shepherd's salad. Desserts include kunefe, which is a baked pastry with sweet cheese inside. Prices are fairly high in this restaurant, but not exhorbitant, especially by Park Avenue standards. My chicken sis kabob entree with no salad, appetizer or dessert came to $34 including tip. I had no alcohol, but only a bottle of San Pelligrino sparkling water. Mixed drinks and single glasses of wine run about $10. I look forward to visiting Bosphorous again to try some other entrees and maybe even have a drink. In addition to the beautiful inside dining room, Bosphorous also has a few tables outside on the sidewalk for diners who love to watch people walking by on stylish Park Avenue. Bosphorous also has a restaurant of the same name in the Dr. Phillips area of Orlando.